Michael Cole has led Kia's UK subsidiary to record sales since taking charge in 2009. 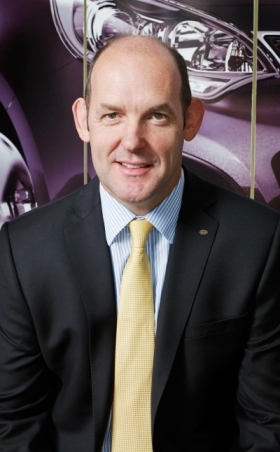 Kia Motors Europe has named its UK head, Michael Cole, as its new chief operating officer. Cole, a longtime Toyota executive before he joined Kia, succeeds Paul Philpott as the fast-growing Korean automaker's No. 2-ranking official in Europe after President Brandon Yea. Cole, 48, has been shattering sales records at Kia's UK subsidiary since taking over as managing director in August 2009. Cole and his team set a record for full-year sales in 2010 and topped that mark in just 10 months when the brand's UK sales through October rose to 57,736 vehicles. Kia UK is on track to sell a new all-time high of more than 65,000 vehicles this year. Cole's new challenge will be meeting or exceeding Kia's aggressive growth plan for Europe. The automaker wants to have a 3 percent share of the European market by 2016 or 2017 – a deadline that already has been pushed back twice (from 2013 and then 2015) because of the region's debt crisis. Nevertheless, Kia expects European sales to rise 13 percent to a record 340,000 units this year. After 10 month, Kia's European sales were up 18 percent to 285,883 vehicles giving it a share of 2.7 percent, according to industry association ACEA. "Michael is the ideal person to take on the responsibility of growing Kia's brand appeal and commercial strength in a European market that continues to face some very big economic challenges," Philpott said in a statement. "He will find a strong team and organization at Frankfurt and I know, from my own experience, that all of the European subsidiaries and distributors will welcome his cool, calm and reasoned approach to the car business." Kia named Philpott, 45, CEO of the automaker's UK and Ireland unit in July following a successful three-year stint as Kia Europe COO. He is the first non-Korean head of any Kia subsidiary in Europe. Cole starts his new job Monday based at Kia Europe's headquarters near Frankfurt. He will be responsible for all of Kia's pan-European operations including sales, marketing and aftersales as well as managing relations with the company's car assembly plant in Zilina, Slovakia.